The Ferrari GTO (often referred to as Ferrari 288 GTO) is an exotic homologation of the Ferrari 308 GTB produced from 1984 through 1987, designated GT for Gran Turismo and O for Omologato (homologated in Italian). The Ferrari GTO was built to compete in the new Group B Race series and a minimum of 200 cars were required for homologation. However, after the death of Henri Toivonen and his co-driver Sergio Cresto in the 1986 Tour de Corse, the FIA disestablished the class, leaving just the Group A Rally championship. As a result, the GTO never raced and all 272 cars built remained purely road cars. Some of the GTO's styling features were first displayed on a 308 GTB design exercise by Pininfarina shown at the 1977 Geneva Salon. 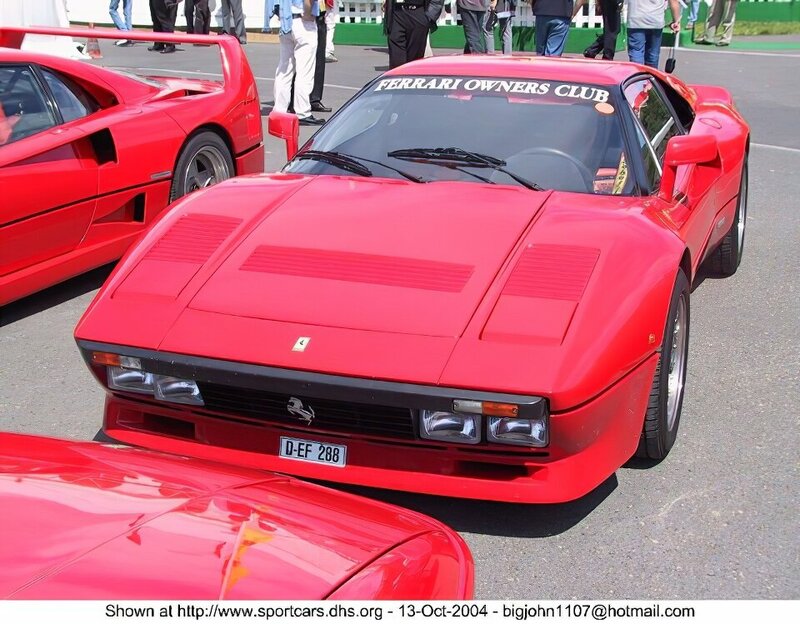 The 288 GTO started out as a modified version of the 308/328 to hold down costs and to build the car quickly. But little of the 308/328 was left when the 288 GTO was finished. Easily noticeable differences were the GTOs bulging fender flares, larger front/rear spoilers, large "flag-style" outside mirrors and four driving lights at the far sides of the grille. Retained from the original 250 GTO were slanted air vents, put in the GTO's rear fenders to cool the brakes. The GTO also had wider body panels than the 308's because they had to cover much larger Goodyear tires mounted on racing wheels. The suspension's height could be set higher for road use and lower for racing on tracks. Bodywork material was new and lighter for better acceleration and handing. The GTO's weight was only 2,555 pounds, compared to 3,085-3,350 for the 308/328. Steel was used just for the doors because major body panels were made from molded fiberglass. Kevlar was used for the hood, and the roof was made from Kevlar and carbon fiber. The GTO was based on the mid-engine, rear wheel drive 308 GTB (which has a 3.0 litre V8 engine). The "288" refers to the GTO's 2.8 litre V8 engine as it used a de-bored (by 1 mm) V8 with twin IHI turbochargers, intercoolers, and Weber-Marelli fuel injection. The 2855 cc engine capacity was dictated by the FIA's requirement for a Turbocharged engine's capacity to be multiplied by 1.4. This gave the GTO a theoretical engine capacity of 3997 cc, just under the Group B limit of 4.0 litres. Unlike the 308's 2926 cc engine, the GTO's 2855 cc engine was mounted longitudinally, using the 308's rear trunk space. This was necessary to make room for the twin turbochargers and intercoolers. The racing transmission was mounted to the rear of the longitudinal engine, moving the rear differential and wheels aft. The arrangement also let the GTO use a more conventional race-car engine/transmission layout for such things as quick gear ratio changes for various tracks. As a result, the wheelbase was 110 mm (4.3 in) longer at 2,450 mm (96 in). The track was also widened to accommodate wider wheels and tires (Goodyear NCT 225/55 VR16 tires mounted on 8 x 16 inch Speedline wheels at the front and 265/50 VR16 mounted on 10 x 16 inch wheels at the rear) to provide increased cornering and braking performance and the ability to apply 400 hp (298 kW) and 366 lb·ft (496 N·m) of torque to the ground. The GTO was an impressive performer, with 0-60 mph times around 5 seconds. Ferrari claimed 0-125 mph (201 km/h) in 15 seconds flat and a top speed of 189 mph (304 km/h), making it the first street-legal production car to reach 300 km/h (186 mph). Ferrari also built five 288 GTO Evoluzione models with more aggressive and aerodynamic body styling and increased power. The engine in the 288 GTO Evoluzione originally put out as much as 650 hp (480 kW). 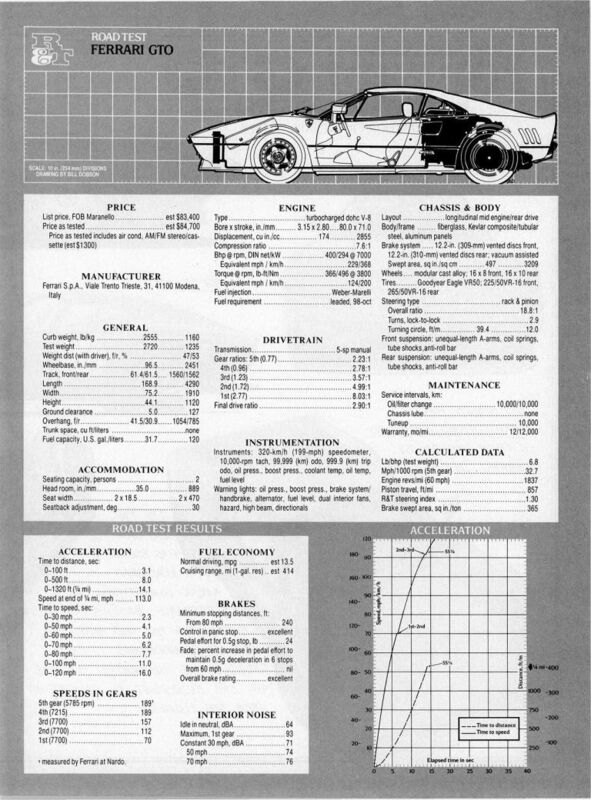 With weight of 940 kg (2,072 lb) the car had a top speed of 225 mph (362 km/h). These cars form the clearest visual link between the 288 GTO and the F40 soon to follow. All five are still in existence with one owned by the Factory on display in the engine manufacturing facility in Maranello. Several Formula 1 drivers were offered GTO's by Enzo Ferrari. These include Michele Alboreto (56195), Keke Rosberg (56653) and Niki Lauda (58329). In 2004, Sports Car International named this car number two on the list of Top Sports Cars of the 1980s, behind its German rival the Porsche 959. The photo Ferrari-288-GTO-5609.jpg (Ferrari 288 GTO - Ferrari 288 GTO) was uploaded by: bigjohn1107@hotmail.com.